Today’s haiku is by: Jasper. 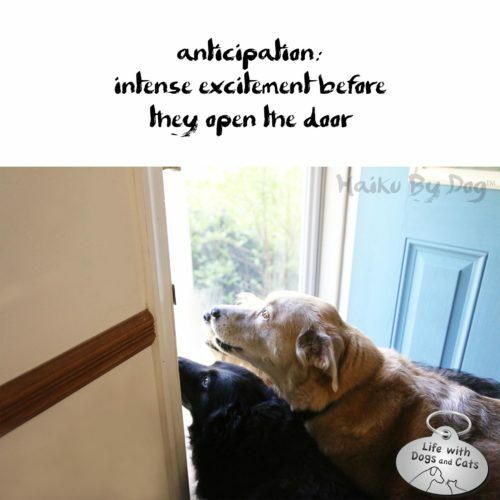 Everyone who comes to our door gets a special greeting: a bouquet of barks, howls, moans and whines, accompanied by tails wagging so hard that dog bodies morph into wiggling crescents of joy. The welcoming committee doesn’t reserve this ceremony for just immediate family. The UPS delivery guy, the plumber, the woman trying to sell me new windows—all wind up on the receiving end of canine elation. Friends and family members may detect a slightly higher pitch in the cries, perhaps a touch more exuberance in the bounce, and maybe an expanded performance. But no visitor to my home escapes the passionate reception composed of nearly 200 pounds of energetic dog, 12 dancing feet, and three wayward noses. This is why we provide guidance to every human who walks in our door: “Four on the floor,” we say. “Do not pet anyone whose four feet are not on the floor.” This is the only way we can hope to discourage jumping, and attempt to train our dogs to offer a less vigorous welcome. My dogs are eight and nine years old, and have lived with us nearly all their lives. We’ve been training them in appropriate greetings since Day 1. At this point, we’re about 2/3 of the way there; Jasper, our 70+ pound moose dog, still has trouble staying grounded, but it’s a work in progress. When we finally have the bounce under control, maybe I can begin to work on the errant nosicles. How do your pets greet visitors? 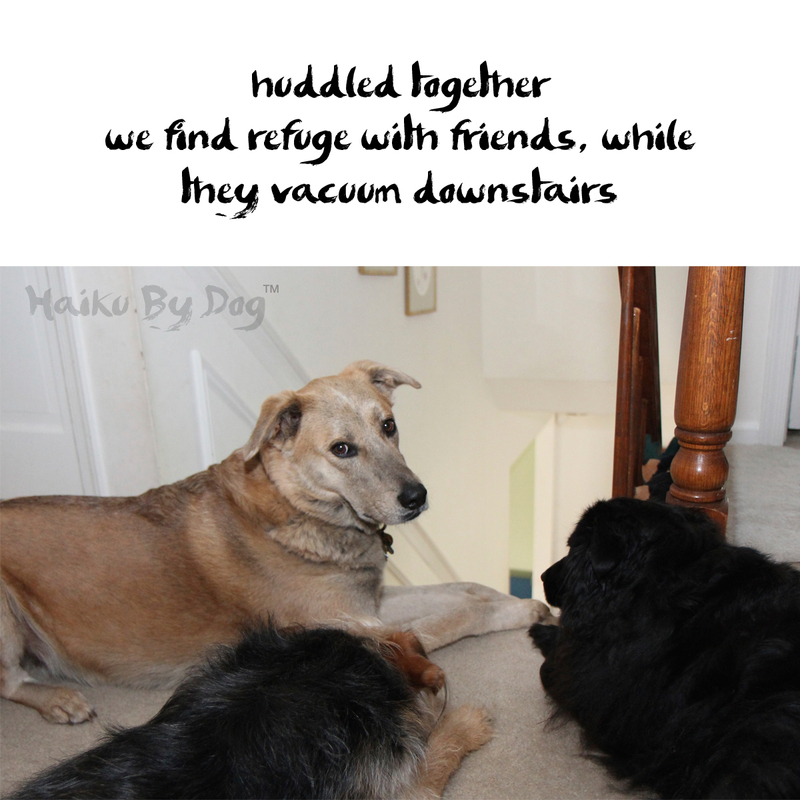 1 Comment on "Haiku by Dog: Before"